The creative team behind last year’s hugely entertaining Sleeping Beauty return to the Lichfield Garrick with a production of a similarly high standard. 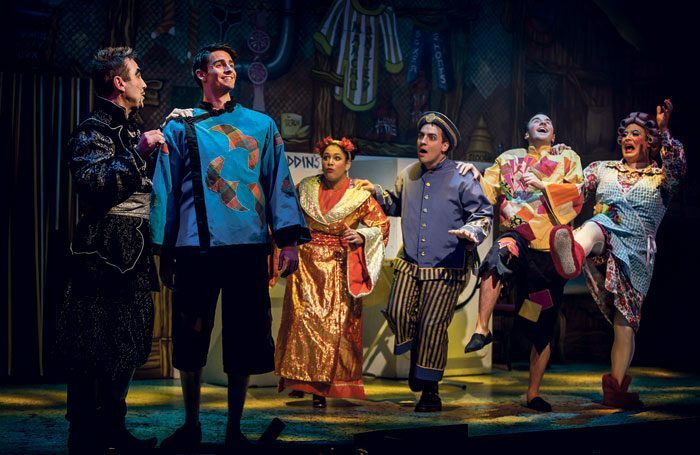 Returning duo Sam Rabone and Ben Thornton as Widow Twankey and Wishee Washee have superb comic timing and their material, from the pen of Paul Hendy, is fresh and lively, though their biggest laughs come from that most delicious of panto treats: a truly messy, slippery, slapstick scene. Spirit of the Ring Lizzie Wofford gets big laughs, too, not least from her exaggerated local accent, while towering Cameron Johnson makes his not inconsiderable presence felt as a genial Genie of the Lamp. The production values are high throughout though the flying carpet scene is slightly undermined by the stage technician fitting the harness in plain sight before take off. The design, both scenery and costumes, are superb and Tim Ford’s production offers several surprises, including the appearance of a full-sized mechanical elephant.